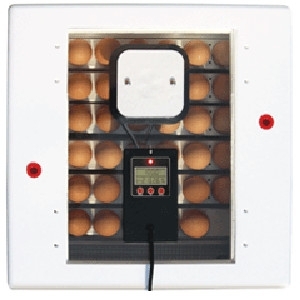 Digital Display - shows temperature, humidity, and days to hatch. IncutekTM Heater - Heats to factory pre-set of 100° F within minutes. Days to Hatch Countdown – Set at 21 days. Adjustable for a variety of eggs. Hi/Lo Temp Notification – Light flashes when outside of range(<97° F or >103° F). Integrated Fan – Pulls in and circulates fresh air to stabilize temperature and improve hatch. Automatic Egg Turner – Eliminates manual handling. Holds 41 eggs. Egg Candler – Check the internal development process of the eggs. Durable Plastic Shell – Protects incubator and is easy to clean. Large Picture Window – Provides 360° unobstructed view inside incubator. Great for educational observation. Deep Bottom Tray – To accommodate even large duck & goose eggs. Eco-Friendly – Made with recycled and insulating polystyrene foam.